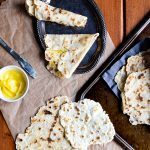 Join the holiday lefse hype with this gluten free lefse recipe! A few simple swaps make this recipe gluten free and dairy free. Prepare the potatoes. Peel potatoes and cut them into large, uniform chunks. Measure out 3-4 cups of potatoes and put in a large pot. Cover with water. Bring the pot to a low boil. Cook until the potatoes are soft and easily pierced with a fork – about 15 minutes (depending on the size of your potato pieces). Drain the potatoes and transfer to a large bowl. Using a fork, potato masher, or potato ricer, mash the potatoes until no lumps remain. Add the ghee, coconut milk, honey, and salt, and mix until completely combined. At this point, you can refrigerate overnight and add the flour/cook the lefse the next day. Alternatively, you can just continue on right away. When you’re ready to make the lefse, add the arrowroot powder and 1 cup cassava flour to the potato mixture and mix until fully combined. At first, it will be very crumbly, but eventually it starts coming together into a workable dough (patience is a virtue). Clear a large work space and sprinkle with arrowroot flour. Turn the dough onto the counter and knead a few times to bring it to a smooth ball. If you find that your dough is too wet and it sticks to your hands or your workspace, add additional cassava flour a tablespoon at a time until the dough is no longer too sticky to work with. If you add too much flour, and the dough will no longer stay together, you can add coconut milk or ghee a teaspoon at a time to bring it back to a dough consistency. Using your hands, make equal-sized balls out of the dough. Size varies depending on how big you want your lefse to be. I made balls about an inch in diameter. Heat a griddle or large cast iron pan to medium-high. Sprinkle a little more arrowroot flour onto your work surface. One at a time, flatten your dough balls and roll out very thin with a rolling pin. Using lefse stick/spatula (if you have one), transfer the thin patty to the griddle. Let cook for about 1 minute on each side or until slightly golden. You don’t need fancy lefse equipment to make this, but it helps. If you don’t have the special equipment, just make small patties – they’re much easier to transfer to the griddle! Note: This recipe was updated 9/9/16 to clarify some measurements!